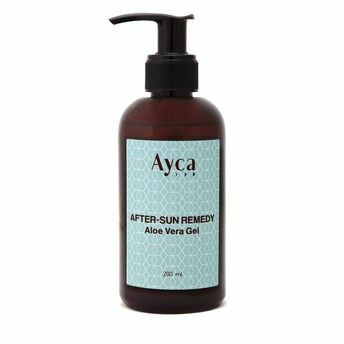 Ayca's After-Sun Remedy is a soothing and non-greasy pure aloe vera gel formulation, which helps sunburnt skin heal quickly and effectively. The essential oil blend of Lavender and Frankincense helps reduce redness and heat in the skin, providing quick relief. Essential Oils of Lavender and Frankincense in pure Aloe Vera with a cellulose-derived gelling agent.